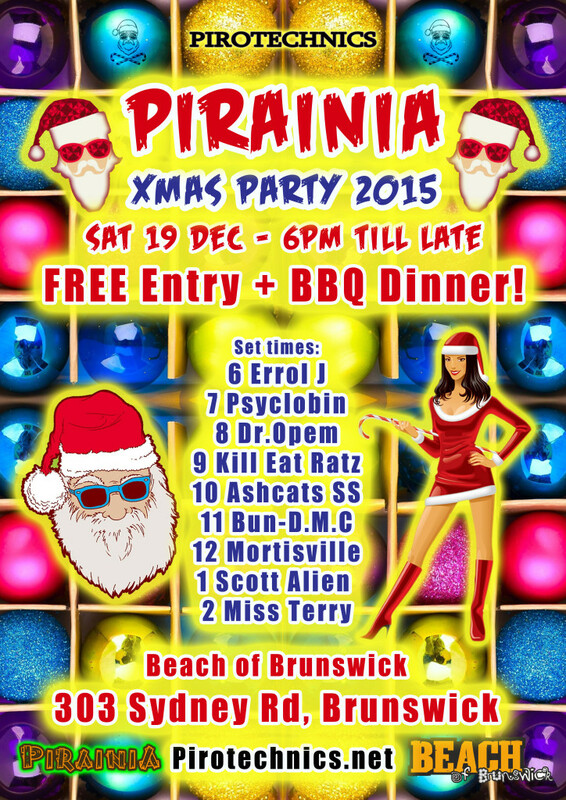 Pirotechnics » Blog Archive » Pirainia Christmas party 2015! It’s the Pirainia Theme Camp crew Christmas party! We’re having a Xmas Burner BBQ & Party with awesome DJs & Free Entry! Pirainians, Doofers, Theme campers & Captain Palette crew! You are all invited to join us as we unite for a festive season get together with some tunes, drinks, food and fun. FOOD: In true aussie tradition we will be have a festive season bbq! We will be selling vegetarian food and unicorn meat to raise funds for our theme camp so let’s enjoy a tasty meal together. FUNDRAISING: While this is a free party we do request donations! We will have a donation bucket and be selling food to raise funds. All funds will go towards fixing a speaker that got damaged at Earthcore and towards getting a Pirainia Marquee. Dress theme: Festive Fantastic! Get your Christmas Creative juices flowing and dress up in your most festive fantastic outfit. No BYO. – Management Reserve Right of Admission.